A Game With One Winner by Lynn Raye Harris begins with Caroline Sullivan and Roman Kazarov meeting face to face for the first time since Caroline called time on their relationship 5 years ago. Five years ago Caroline was forced to choose between her duty to her family legacy and her love for Roman, unfortunately duty won out. Caroline ended her love affair with Roman and went on to marry another man. This fall out cost Roman not only the woman he loved but also his job and his Green card resulting in him having to move back to Russia. Five year on to say Roman is out to seek revenge is putting it lightly, he’s out for blood namely Sullivan’s Dept Stores.“I’m sorry, Roman,” she said, despite her determination not to. “I didn’t mean to hurt you.”His laugh stroked softly against her heightened nerves. “Hurt me? Nyet, my darling. You did not hurt me. Wounded my pride a bit, perhaps. But I quickly recovered, I assure you.”Caroline swallowed. She’d been devastated after that night, but she’d borne it all with quiet stoicism. Jon had been the only one who’d known what it had cost her to marry him. (Harris 24) This book was aptly named; Caroline and Roman are both fighting for Sullivan’s, one’s loss will be the other one’s winnings. Roman was an Alpha hero true to form. My one peeve with this book was that it was never quite explained how Roman went from being jobless to a Billionaire over a relatively short period of time - three years. I really liked Caroline and how tough her character was, she was no damsel in distress, she was tough and resilient under all the adversity she was faced with. Her eyes narrowed. “I’m going to enjoy this,” she said, her voice hovering on the edge of ferocity. “Because I will never do what you expect me to do, Roman. 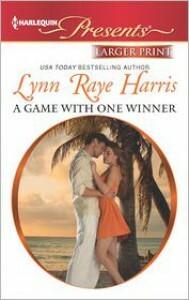 You’ve placed your bet on the wrong pony this time.” (Harris 51) A Game With One Winner by Lynn Raye Harris is a “classic” Presents loaded up on all the trope’s we enjoy in a category romance. 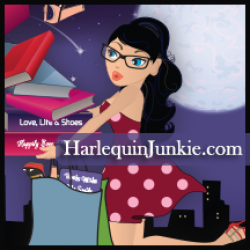 If you a fan of the revenge plot; re-union stories; secret babies; second chances this book certainly has a little something for every category romance reader to appreciate and enjoy.